Business dinner, party or event … wedding rehearsal dinner … corporate banquet or function … a night on the town … birthday or anniversary party … or no reason at all. When choosing the Wildwood to host your dinner, you will receive high quality service and a diverse value-driven menu that creates a great dining experience. 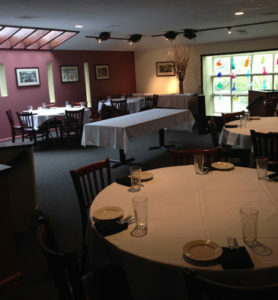 We can accommodate groups of 15 to 55 guests in our private function rooms. Full service dining including appetizers, entrees and desserts, beverages and cocktails also available. Please call (508) 481-2021 if you have questions. Thank you for selecting the Wildwood Steakhouse for your upcoming event. Please fill out the following information and mail, fax or e-mail this form. that include the freshest raw bar and finest selections. Choose from one of our three value-driven dinner menus that include a great selection of appetizers, salads, entrees and dessert. Beverages also available.